Partisanship is almost always just beneath the surface of most writing about the Middle East. Gilbert Achcar’s book is no exception. In recent years, scholars have focused on the sensitive issue of the collaboration between some Arab political leaders and the Nazi regime, and on its ideological aftereffects. The scholarly debate became even more charged after September 11, when the issue of the similarities and the differences between Islamism and Nazism became a political matter as well as an academic one. In The Arabs and the Holocaust, Achcar, a professor in the School of Oriental and African Studies at the University of London, has penned a response to that discussion from the perspective of left-wing anti-Zionism. The book makes three central points. First, Achcar makes the welcome acknowledgment that there were Arab leaders who willingly collaborated with Nazi Germany, and that they were embedded in the Islamist tradition. Second, he draws needed attention to those leftist and liberal Arab political and intellectual figures who opposed Nazism and fascism as well as Zionism. Third, he attacks Zionist leaders and a host of historians for making what he views as erroneous generalizations about the extent of Arab support for Nazism, and for focusing on these issues in order to legitimate Zionism. On the first two points, Achcar succeeds by drawing on—and adding to—the existing work in the field. But his third point undermines his book’s virtues with a series of unfair attacks resting on partisan readings of scholars with whom he disagrees. Achcar’s intention is “to render the complexity” of the Arab response to the Holocaust. “To be sure,” he writes, “one finds many odious attitudes toward the Holocaust in the Arab world; but one also finds absurdly distorted interpretations of the Arab reception of the Holocaust in Israel and the West.” He especially wishes to draw attention to the Westernizing Arab liberals and leftists who opposed Nazism as well as Zionism on the basis of democratic and humanist values. He wants to distinguish them from the Islamists who willingly threw in their lot with the Third Reich. Achcar takes aim at the scholars—Martin Cuppers, Elie Kedourie, Matthias Küntzel, Bernard Lewis, Meir Litvak, Klaus-Michael Mallmann, Esther Webman, and Stefan Wild—who have written major works on Nazi policy toward the Middle East in World War II and on the Arab response to those policies. He criticizes these historians of Nazi-Arab collaboration for contributing to a “hegemonic narrative” according to which a majority of Arabs are portrayed by these authors of “anti-Arab propaganda” as having supported Nazism in the 1930s. For anyone who has read the works that he is referring to, The Arabs and the Holocaust is a frustrating book to read. Achcar criticizes texts without fairly presenting their arguments and their evidence. From reading Achcar, the reader would be unaware that in fact none of these scholars engages in generalizations about all Arabs. None of them assumes that opposition to Zionism was, in and of itself, tantamount to sympathy for Nazism, or that it was only the product of anti-Semitism. And much of what they discovered and examined forms the empirical foundation for Achcar’s own study. The core of Achcar’s argument is in his chapters about four currents of Arab response to Nazism, especially in the 1930s and 1940s, which he usefully describes as composed ofMarxists, liberal modernizers, nationalists, and “reactionary and/or fundamentalist Pan-Islamists.” His discussion of the Arab Communist parties is particularly interesting. He documents their enduring opposition to Zionism—they regarded it, not surprisingly, as a distraction from the class struggle—and to Jewish immigration to Palestine at least until the early 1940s. While Arab Marxists criticized anti-Semitism or anti-Judaism, they distinguished those hatreds from anti-Zionism. Indeed, he writes that Jewish members of the Communist parties were “often more militantly anti-Zionist than their Gentile comrades.” In May 1946, for example, Jewish members of the Iraqi Communist Party, grouped in a “League against Zionism,” wrote to Stalin demanding that he support the Palestinian cause at the United Nations. Arab Communists were so uniformly opposed to the creation of a Jewish state in Palestine that they reacted with dismay to the Soviet support in 1947 for the plan to partition Palestine into a Jewish and a Palestinian state. In the same year, the Iraqi Communist Party called Zionism a “movement that is racist, religious, reactionary, and false to the Jewish masses,” described partition as “an old imperialist project,” and claimed that partition would lead to “subordination of the Arab majority to the Zionist minority in the proposed Jewish state.” Achcar observes that Soviet support for partition left the Arab Communists “isolated in Arab public opinion for some time to come.” He does not point out that from the early 1950s on, the Soviet Union did all it could to overcome that isolation and fan the flames of anti-Zionism, and often anti-Semitism as well. Achcar’s chapter on “liberal modernizers” will introduce readers to some less familiar voices, beginning with his father Joseph, who opposed Nazism but, in his doctorate in 1934 at the University of Lyon wrote that “it is not possible to redress one injustice,” namely Nazi anti-Jewish persecution, “by another, more serious and costly injustice,” that is, Zionist plans to establish a Jewish state in Palestine. He also refers to a “propaganda literature” that has “always projected the Mufti’s [Hajj Amin al-Husseini’s] opinions onto all the Arabs of Palestine, with a view to portraying them as ardent partisans of the Axis powers,” but he does not specify what literature he has in mind. He then acknowledges that “with the exacerbation of tensions” in Palestine, “especially from 1936 on, the radical wing of the national movement led by the Mufti of Jerusalem, Hajj Amin al-Husseni, came to represent the Arab majority view in Palestine.” If Achcar can acknowledge Husseini’s support by a majority of Palestinians, why is the recognition of the same fact by the Zionist leaders or subsequent scholars owed to a sinister effort to project Husseini’s view onto that majority? Achcar’s discussion of the response to Nazism by Arab nationalists is informative and in certain ways refreshing. He acknowledges that some of them sympathized with fascism and Nazism, and advocated an anti-Zionism infused with Jew-hatred. Yet having recognized these important realities, and having criticized several historians who engage in apologetics about these matters, Achcar criticizes the German historian Stefan Wild’s essay “National Socialism in the Arab Near East between 1933 and 1939,” published in 1985 in the scholarly journal Die Welt des Islams (The World of Islam). Wild, like Elie Kedourie in Arab Political Memoirs and Fouad Ajami in The Arab Predicament, drew on the memoirs of Sami al-Jundi, an early member of the Syrian Baath Party. Al-Jundi recalled pro-Axis sympathy in Damascus intellectual circles in 1939 and 1940. Whoever had lived during this period in Damascus will appreciate the inclination of the Arab people to Nazism, for Nazism was the power which could serve as its champion, and he who is defeated will by nature love the victor. We were racialists, admiring Nazism, reading its books and the source of its thought, particularly Nietzsche’s Thus Spoke Zarathustra, Fichte’s Addresses to the German Nation, and H.S. Chamberlain’s Foundations of the Nineteenth Century, which revolves around race. We were the first to think of translating Mein Kampf. Whoever had lived during this period in Damascus will appreciate the inclination of the Arab people to Nazism, for Nazism was the power which could serve as its champion, and he who is defeated will by nature love the victor. But our belief was rather different...We were idealists, basing social relationships on love. The Master used to speak about Christ. Achcar writes that “there is no excuse for Wild’s omission of the passage beginning with the word ‘But.” But what excuse does Achcar have for omitting the far more serious passage that begins with the assertion “we were racialists”, and for eliding it with a passage that puts a much more benign face on things? It would seem that it is Achcar, not Wild, who has doctored the document and omitted the key phrase. He rejects the argument put forward by the French leftist Daniel Guérin that “colonial leaders who appeared to be collaborating with the Axis ‘were simply taking advantage of an existing situation in the interests of their movements.’” For Achcar, Guérin’s remark “illustrates the abiding tendency of those who have made the admirable decision to put themselves ‘at the service of the colonized’ to abandon critical thinking when dealing with victims of imperialism–especially those of their own country...the argument that ‘my enemy’s enemy is my friend’ has all too often served to excuse the worst sort of compromise with, and even acceptance of, infamy.” This is a most welcome criticism of such awful left-wing apologetics. It is surprising, after all this, to find Achcar making the implausible claim that after the war Hajj Amin al-Husseini was unimportant. His reputation had “reached a low ebb in Arab and Palestinian political circles with the defeat of the Axis.” Achcar acknowledges that “the Palestinian population nevertheless continued to regard the Mufti as its leader since no alternative had emerged.” Yet it was precisely members of some of the same “political circles” who, in 1946, unanimously elected Husseini as President of the Arab Higher Committee, the central organization of the Palestinian national movement. His reputation was clearly quite untarnished in this environment. Moreover, Achcar does not explain why “no alternative” had emerged, or why the alternatives that existed among the secular liberal forces were defeated by Husseini and his associates. In fact, Husseini emerged preeminent in post-1945 Palestine despite, and in some cases because of, his wartime propaganda declarations from Berlin against the Allies and the Jews and because (as Edward Said noted) his election rested on a consensus in Palestinian political circles. Achcar cites the Israeli historian Zvi Elpeleg’s comment that “the memory of Hajj Amin disappeared from the Palestinian public consciousness almost without trace.” He takes Elpeleg’s quotation out of context. 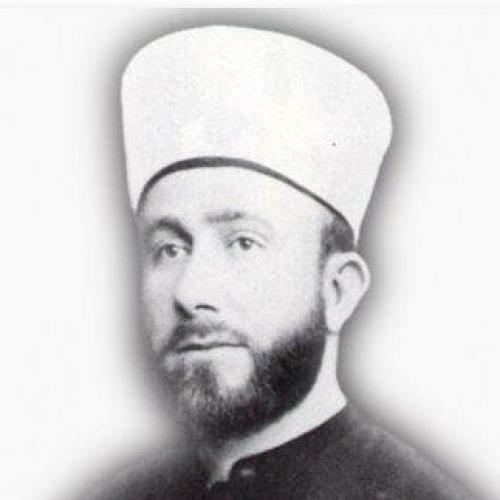 In the same work from which Achcar is quoting, Elpeleg concluded that though Husseini was “denigrated and forgotten” at the end of his life, it was the Mufti who laid the foundations for the national movement. Elpeleg concluded that “there is almost nothing in the PLO doctrine, or in the national charters of the Palestine National Council, which had not already been conceived and given expression by Hajj Amin, but the PLO does not even take the trouble to pay lip service to Hajj Amin for this. This is a sad fate for a man who, during his lifetime, embodied more than any other, the appearance of the Palestinian national movement and its decades of struggle.” Elpeleg’s point, in other words, is just the opposite of the impression left by Achcar’s selective quoting. Achcar delivers equally unfair attacks on the work of the Israeli historians Yehoshafat Harkabi, Meir Litvak and Esther Webman and the German political scientist, Matthias Küntzel, all of whom have written works that are crucial for understanding the extent and the nature of Arab collaboration with Nazi Germany, and its aftereffects. He subjects Litvak’s and Webman’s very important study, Empathy and Denial: Arab Responses to the Holocaust, to particularly unfair criticism. These historians examined major Arab newspapers and journals, as well as books and essays by prominent scholars and journalists, to describe what they regard as the dominant published opinion in the Arab societies about the Holocaust. They presented abundant evidence regarding Holocaust denial and, in the wake of Islamization, Holocaust justification. Their pages are filled with quotations from eminent authors in the decades since the Holocaust who equate Zionism with Nazism, and the Palestinian refugee crisis with the Holocaust. Litvak and Webman report, for example, that in 1998, after Roger Garaudy, the French Holocaust denier and anti-Zionist, spoke of “the myth of the Holocaust,” “Arab intellectuals, writers, journalists, politicians and clergy embraced the man and his book.” Publishers brought out an Arabic edition. The book conveyed by then familiar themes: Zionism is a danger to the world; Jews and Zionists dominate international affairs; Israel is a racist state; Zionists collaborated with the Nazi regime and then fabricated the myth of the Holocaust to extort money from guilt-ridden Germany. Any criticism of these views was seen as part of “the West’s attack on Islam.” To Litvak and Webman, the enthusiastic Arab reception of Garaudy was evidence of the importance of the Arab “Holocaust discourse” that had been developing for decades. Achcar agrees that the Arab reception of Garaudy was “a calamity,” and was evidence of “the intellectual regression that has been under way in the Arab countries for several decades now.” Yet rather than applauding Litvak and Webman for documenting and interpreting a key element of this regression, Achcar expresses astonishment at the “ethnocentric complacency” that supposedly prompted their criticism of Edward Said for seeking mutual recognition of the Holocaust and the Palestinian fate after 1948. This, despite Litvak’s and Webman’s acknowledgment of Said’s plea that Arabs speak frankly and honestly about the Holocaust, and Achcar’s own acknowledgment that the mass murder of Europe’s Jews ought not be equated with the Palestinian refugee crisis. If Achcar can criticize this equation, these Israeli historians should be able to do so too, and without being accused of “ethnocentric complacency,” which is a euphemism for saying they are guilty of “anti-Arab racism.” The charge is baseless. Achcar’s treatment of Matthias Küntzel’s Jihad and Jew-Hatred: Islamism, Nazism and the Roots of 9/11 is equally regrettable. He calls it a “fantasy-based narrative pasted together out of secondary sources and thirdhand reports” that points to a “direct line of descent from Amin al-Hussein and Hassan al-Banna through Gamal Abdel-Nasser to Osama bin Laden.” In fact, the rather embarrassing fact is that Küntzel’s analysis of al-Banna, Husseini, the Muslim Brotherhood, Sayyid Qutb and Islamism in general runs along the same main lines as Achcar’s own account of the Pan-Islamist reactionaries from Rashid Rida onward. (The major difference is that Küntzel draws on biographies of Yassir Arafat to examine his connection to Husseini and with that, to draw attention on the impact of the Islamist tradition on the history of comparatively secular Al Fatah and the Palestine Liberation Organization.) Should we therefore dismiss Achcar’s own account as a “fantasy-based narrative,” or should we recognize that scholars with different political opinions can agree on a common set of facts? Given Küntzel’s eloquent defense of Israel, Achcar may be embarrassed by the similarity of his view of Islamist Jew-hatred with Küntzel’s view. But such discomfort does not excuse his intemperate attack on a scholar who shares his roots in Enlightenment values. Finally, Achcar wades into the issues of postwar German history and the memory of the Holocaust, a subject about which a large body of scholarship exists. Not surprisingly, he calls the West German support for the state of Israel from Adenauer onward a form of “philosemitism,” that is, a mix of cynicism and sentimentality that was the price West Germany paid for integration into the West during the Cold War. If Achcar had bothered to read more works in German history, he would have learned that financial restitution for Jewish survivors and for the state of Israel found its strongest support among Social Democrats and moderate conservatives around Konrad Adenauer, while it was denounced most vociferously as a cynical ploy by the East German Communists and only reluctantly accepted by the right wing of Adenauer’s Christian Democratic Party. The term “Islamophobia” suggests that there is an irrational fear, a “phobia,” that is widespread in Western society about the religion of Islam. The term is too often deployed to deflect criticism which is not aimed at the religion of Islam or at Muslims, as such but at those ideological currents that terrorists adopt. The discussion and criticism of Qutb, bin Laden, Ahmadinejad, or the Hamas Charter do not rest on a “phobia” about the religion of Islam. They stem from a fully rational fear of terrorism, and by a lucid and empirical grasp of the reality of Islamist fanaticism. Those of us who have written about Islamism and its connection to the terrorist attacks of the past decade have always gone to great effort to define this tradition as an extremist interpretation of the traditions of Islam. We have distinguished between Islam and Islamism, but we have also insisted that it is naïve to assume that when terrorists say they act in the name of Islam that their actions have nothing at all to do with their interpretation of the religion. To criticize Islamism is not a sublimation of hostility to Islam. It is the result of an interpretation of widely known facts about one extremist interpretation of that religion. The Arabs and the Holocaust has elements of candor and courage. It is a salutary development that someone with Achcar’s political views acknowledges the realities of the Nazi-Islamist wartime collaboration. It is important to be reminded of the history of a secular Arab leftism and liberalism that opposed fascism, Nazism, as well as Zionism. Yet Achcar undermines these virtues of his book with superficial, unfair, and unreliable readings of those with whom he disagrees, above all those who fought fascism and Nazism on the basis of secular, liberal, and even leftist values yet still support Zionism. His attack on these scholars is neither a contribution to scholarship nor a contribution to moderation. Jeffrey Herf is Professor of Modern European History at the University of Maryland., College Park. His most recent book, Nazi Propaganda for the Arab World (Yale University Press, 2009) was awarded the 2010 Bronze Prize from the Washington Institute for Near East Policy.